My name is Joanne and I am the Divine Life Yogini. I have been a teacher of Hatha and Kundalini yoga and these were just two of the many extremely challenging, yet extremely enlightening situations my family and I experienced when we moved to Italy to open a Yoga Retreat over 12 years ago. I dreamt of a beautiful retreat in sunny Italy, but I found myself with a half-built house in the hills and struggling to bring up four children. Yet through adversity, I began to realize that problems can be blessings in disguise as there is a purpose to every situation and a reason for every relationship. Through my challenges and finding out the truth about my relationship and trying to sell our house to come back home, I was forced into self-examination and self-discipline; I studied sacred yogic sutras, ancient Buddhist texts and spiritual books from around the world. This was my journey of self-discovery and realization which led me to see that love is all there is and that self-love is the answer to all our problems and to all our sufferings. For the human journey is really about the letting go of fear which is the egoic mind and embracing love which is our true higher self, as every thought and feeling we think and feel is based in either fear where we attract painful experiences or based in love where we attract pleasurable experiences. Releasing our fears means bringing to the surface all those fearful, painful, negative aspects of ourselves that we have been trying to suppress in our pain-body. I saw that my fear of unworthiness which came from the things I did when I was young, my fear of failure from not having my yoga retreat and my fear of not being good enough over the years had been giving off strong vibrations, and by putting my attention on my fears I had manifested them into my reality. My ego feeds on fear which comes from my memory of past conditionings and hurts. Yet fear cannot exist in the present because the present is a completely new and pure moment of now which is filled with the power of divine love and is not tainted by any negative emotions from my past. When I live in the now I am secure in my truth and peace and love, and I do not need, want or fear anything which gives me true freedom! I saw that fear and negative emotions are all in my egotistical mind; they are just thought waves and thought waves in my mind can be changed. Through my awakening, I wanted to share the experiences that had happened to me so others would be able to receive hope and inspiration. I remember waking up one morning all those years ago with one single thought in my mind….to bare my soul in a book. So I took my fears, my sufferings, my secrets of life and my spiritual practices, and I started to write them down, as inspiration began flowing through me, it was so intense, so dynamic that I could not let go of my pen! I am not a writer, I am a yogini and the first attempts were unreadable and ended up in the waste-paper bin. It wasn’t easy as I was living through my challenges and with 3 young daughters and a baby to mother it was difficult to find the time….However, I persevered and with yoga and meditation practices heightening my consciousness the story started to come out. It seemed to me that if I explained how yoga and my yogic diet and lifestyle were helping me cope then it could help others too. Hard as it was the words came….my Sat Guru Yogiraj Siddhanath was invaluable to me and his wise wisdom always seemed to find resonance. Slowly my troubles started to become lessons I could learn from and transform, and I mean slowly, for it would be 10 years before we would finally sell up and bring our family back to England. At times trying to transcend my ego and seek peace at this moment, was tremendously difficult; I seemed to be fighting with my old self, not wanting to let the negative false ego side of me go. I kept saying “I want change! When is my real life ever going to happen?” I understood the truth in my mind that I am always connected, always one with love, one with God, but I just did not feel it in my heart. I was distracted and could not stay present; for even though my soul longed for freedom, love and peace I could not oppose my dark, fearful feelings. I remember one night when all the children were asleep I prayed to Spirit to give me truth and presence and to give me the realisation of love within. I was so emotional, I prayed and prayed and cried and cried until I eventually fell asleep. The next day I was spiritually guided to watch some inspiring films which gave me deep messages and while practising my Kundalini meditations I began remembering my truth within! I had an intense feeling of love for myself, the stress seemed to release from my mind and body effortlessly and I was perfectly content in the present moment. Amazingly I didn’t feel alone anymore, I felt one with the divine and knew for certain that love was here as a part of me, inside my heart all the time. As long as I seek the light I will have shadows! My shadow side is my unconscious fears and the dark parts of me that I do not want to acknowledge or show to other people. I see that the shadow is only my lower nature limiting me and blocking my light, therefore I must let go of the things that do not serve me and love who I am now! For the more, I choose love over fear and bring light where there is darkness in this world, the more brightly my majestic light shines, which becomes a beacon for others to see through their darkness. I see my shadows are only a projection of me not believing in myself, of me not ‘loving myself’ and that self-love is self-realisation and the realisation of God, of Love within! There were many more disappointments and setbacks, but towards the end of my book I realised that the most important lesson I had to learn in life was not to forgive myself for all the things I went through, but to understand and accept that they were self-created by me and a necessary part of my journey towards me loving me! This profound understanding has allowed me to make Peace with my past, make Peace with myself and want to bring Peace to the world. I felt I had lived out a lot of negative karma whilst in Italy and when I came back to London amazing things began happening to my children and I. My daughter was a finalist on the first ever ‘The Voice Kids’ singing competition on ITV, my son was child modelling for Burberry and my other daughters had become amazing artists and actresses. I began teaching yoga, meditation and speaking at ‘The Best You’ expo, the ‘Om Yoga’ show, the ‘Mind, Body and Spirit’ shows and ‘Yogific Yoga and Vegan’ festivals all over England and I became a Yoga Ambassador for UK Heath Radio, contributing to yoga, wellness and Vegetarian/Vegan talks on “The Way Forward” show. My children and I are vegans because I believe that if you follow the teachings of yoga, harming or killing animals goes against everything yoga stands for. Amazingly I formed the “Peace & Unity through Well-Being Association” for all people to practice mindfulness, yoga, conscious lifestyle, health, nutrition, fitness, well-being and compassion so they feel good, unite together and help contribute to a more peaceful world- we shall be opening our “Well-Being House” in London soon. Even though my book took 9 years to write, eventually, it was picked up by a mainstream publisher, and after everything I have been through, this is incredible! My book “Dreaming of a Divine Life” and “Divine Life Yoga and Wellness Video Course” will give you a positive mind, healthy body, peaceful spirit and abundant life. They may be purchased on my website www.divinelifeyoga.co.uk where you can also listen to my free meditations and my Sat Guru’s incredible free video meditations. If I can overcome adversity and become the yogini and wellness teacher I always dreamed, you can manifest your dreams too! Joanne-Divine Life Yogini has been a teacher of Yoga, Meditation and Well-being for 20 years, and is an Interviewer for UK Health Radio, Watkins Books and Wellness TV! 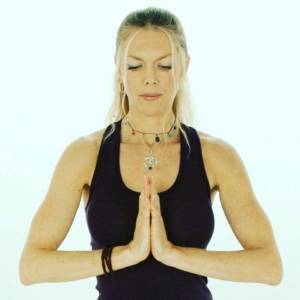 She is an Author, Speaker and creates workshops on Yoga, Well-being and Spirituality, and is a Future Life Progression Practitioner. Divine Life Yogini enjoys helping people achieve a positive mind, healthy body, peaceful spirit and an abundant Life!